Running a design business can be exhilarating and overwhelming at the same time. It’s freeing not to have a boss to answer to, but it can also stink when I don’t have an accounting department to deal with bookkeeping and invoicing. Luckily there are so many resources and tools available to help streamline running your design business! I’ve rounded up 5 essential tools for you below, including my favorite project management tool, what I use to record videos for clients, and favorite ways to create to-do lists. For my business, I know that the more organized I am, the better customer service I can offer my clients. These tools help me set, manage, and exceed client expectations. Which is what we all want, right? Depending on the services you offer each day can look very different. For example, on Monday’s I set aside time to update my bookkeeping and send out any client invoices but that is generally followed by maintaining client websites or digging into client research. Since I am constantly switching tasks it is imperative that I keep everything as organized as possible! Organizing is my jam and almost nothing excites me more than an organizing project. Keeping my projects organized helps me stay on task and makes it so much easier to provide a great customer experience for my clients. 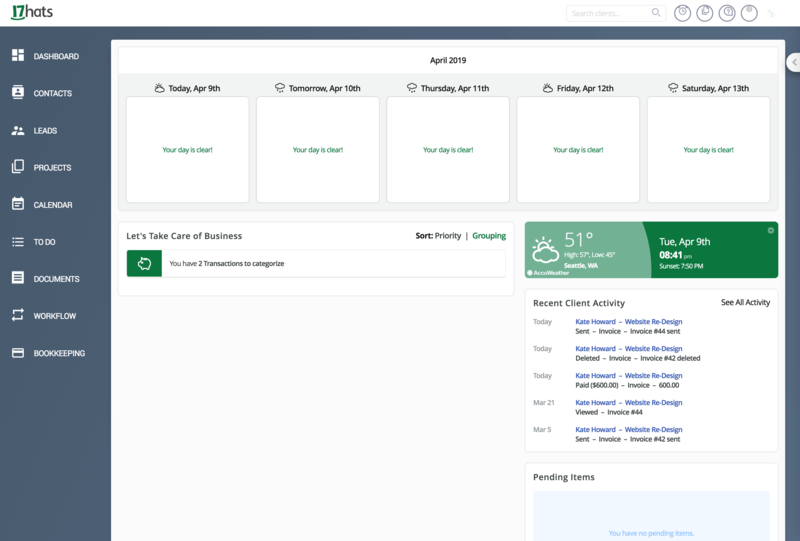 I use a project management tool called Asana to keep all of my tasks and projects organized. I am able to invite my clients to view their project and even assign tasks and due dates to them to help our project stay on track. It helps me communicate each step of any project clearly and is easy for my clients to use. If you’re looking for something to help organize your ideas, design process, and design business tasks I would highly recommend. The best part? The free tier is all you need! Woot, woo! Sending proposals, contracts, and invoices is something that every design business is constantly doing. I used to spend forever drafting custom proposals in InDesign, saving PDFs, sending a PDF to a client, and waiting for them to electronically send it back. If they were ready to sign on they would then have to send a check through snail mail. While this worked for my business, it was such a time sink! I’ve been using 17Hats* to send any proposal, contract, or invoice for two years and I absolutely love it. I created templates so that I can send a proposal and contract to a prospective client within a few minutes. Clients can sign a proposal or contract and even pay the deposit online. You can also link your business bank account to keep track of your bookkeeping and generate profit/loss reports to hand over to your accountant at tax time. I setup canned email responses and connected my contact form on my website so any potential lead emails I can quickly answer, saving me so much time every week. Clients can view proposals, contracts, and invoices via a client portal which is convenient if they need to reference them for any reason. There are a lot of functions that I don’t yet utilize with 17Hats, such as time tracking, automated workflows, or to-do lists. They do have a vast user training section to their site if you were interested in learning how to use those features. 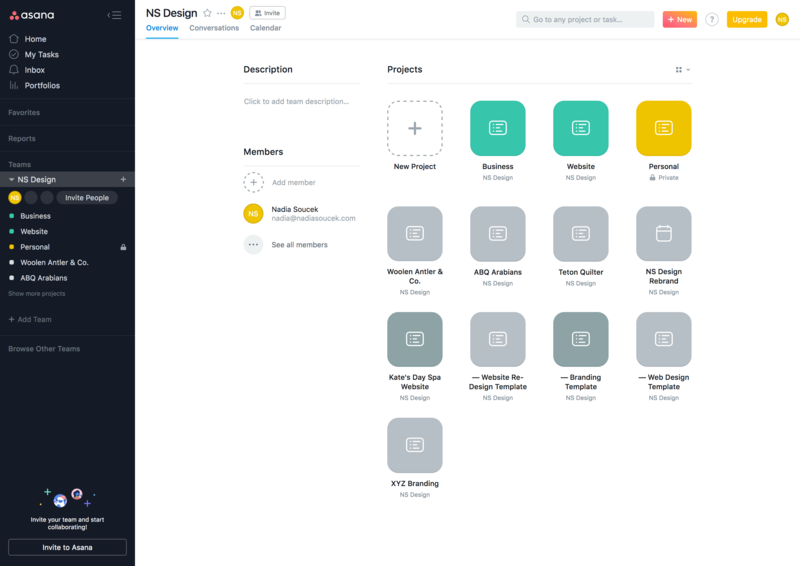 A powerful and functional design business tool indeed! *This contains an affiliate link. You’ll receive 10% off any annual subscription if you sign up using this link. Managing multiple WordPress websites can be very time consuming, especially if you maintain multiple sites for clients like I do. I used to have to log in to each website individually to update plug-ins and themes, as well as check analytics, security, etc. Now I use ManageWP to accomplish all of these tasks and more! With a couple of clicks, you can update plug-ins and themes for multiple sites. I can easily generate reports to send clients so they can see exactly what has been updated, backed up, and maintained. Pricing for ManageWP is stellar! It’s free! 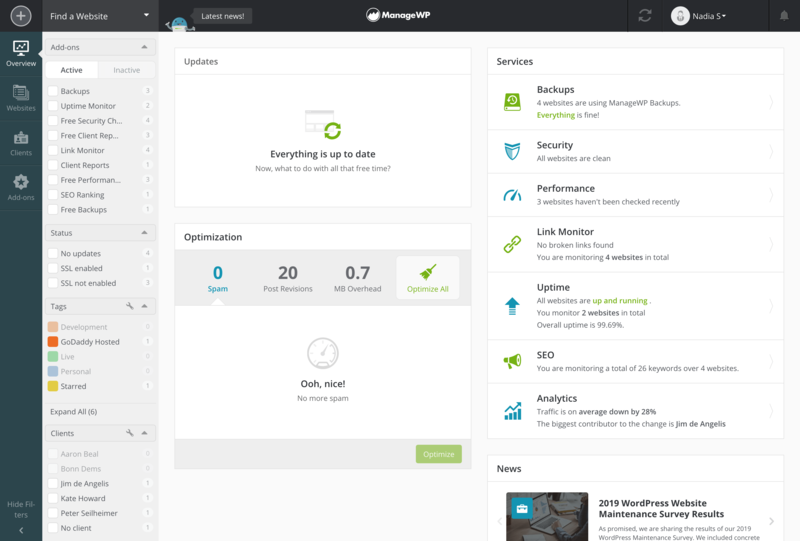 They do have premium add-ons that are super affordable and helpful like uptime monitor, SEO ranking, and auto-backup. Some of my clients host their websites through GoDaddy and because of that a few of the premium add-ons are free too. Handy tool to keep all of your WordPress sites organized and accessible from one dashboard, two thumbs way up! Recently I started incorporating video presentations into my design process since the majority of my clients do not live in the same city. Loom is super simple to start using and has been a game changer for how I on-board, educate, and present designs to my clients. When I have a new client I send them a short welcome video that explains how we’ll use Asana, the project management tool mentioned above. Some of my clients are visual and tactile learners so a multi-page PDF was hard for them to follow. By creating a short video that walks them through each feature and aspect of the project and how we’ll work together has improved expectations and communication all around. Win, win! For presentations, I used to send a PDF to a client and go over the design over the phone, which worked okay but wasn’t ideal. 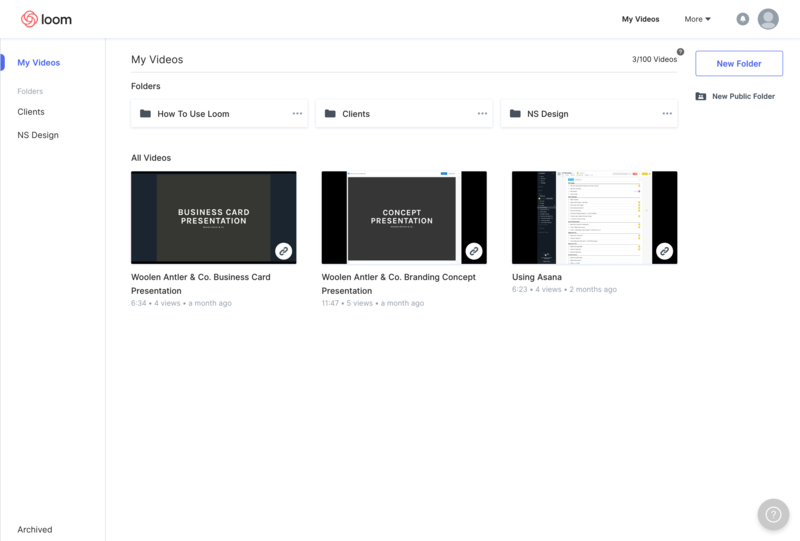 Now I can record a short video that walks the client through each part of the design concept that they can watch and digest on their own time. They can watch it as many times as they like, rather than relying on memory or notes from a meeting. Loom will alert you when your video has been viewed, which is a feature that I didn’t expect to enjoy as much as I do! The free tier is all I use and so far it’s been fantastic. Do you notice a trend here? I love all things organization! I’ve been a huge fan and avid TeuxDeux user for nearly six years, maybe more? It is a paid service, but I pay that fee every year with glee. This is in no way sponsored, just genuine love for the design, functionality, and team behind this app. 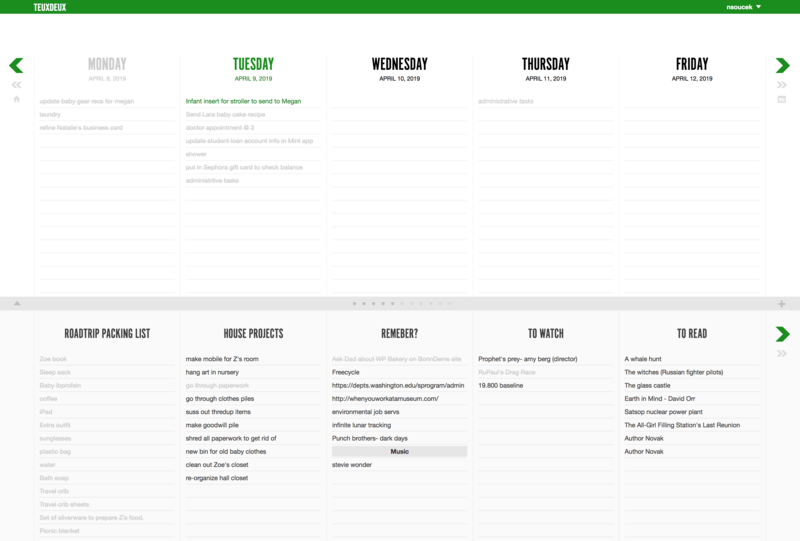 The user interface is based around the weekly calendar, though you can create custom lists that are more like “someday lists”. While I love Asana for more in-depth lists for my design and website projects, TeuxDeux is perfect for keeping my family organized and jotting down project ideas. I have a weekly and monthly recurring to-dos, as well as packing lists for upcoming trips, book recommendations from friends, movies to watch, projects to put on the back burner, and everything in between. It helps me organize high-level design business tasks, life tasks, everyday tasks, and dream tasks all in one beautiful space, which I desperately need in this sleep-deprived stage of life. There are plenty of tools that I use that weren’t mentioned, but these are all heavy hitters in my book. Are there any tools that you use in your design business that I should know about? I’m always on the lookout for functional tools to streamline processes so please share if you’ve got a favorite that wasn’t mentioned above!